Bruce locked himself in his New Jersey home and immediately began writing ideas for what would become the group’s fourth full-length album, The Black [Sumerian Records]. He studied their early material, focusing on capturing that initial magic and rekindling their groove-driven and electronic-laden metallic swing. In order to properly do that, the band actually turned to a fan. Ukrainian singer Denis Stoff gained notoriety posting Asking Alexandria covers on YouTube and consequentially inked a deal with Sumerian Records in his band Make Me Famous. Bruce shot him an email one night. 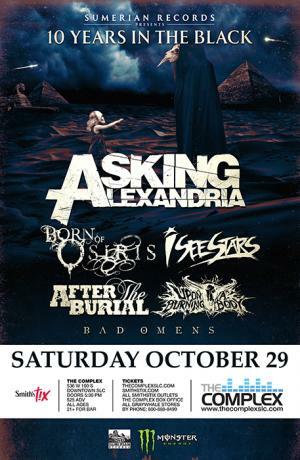 The next day, a new Asking Alexandria song had vocals. Denis made his live debut in front of 30,000 people when Asking Alexandria headlined the Czech Republic’s Rock for People Festival. In between sold out shows around the globe, they ventured back and forth to the Michigan studio of longtime producer Joey Sturgis in order to cut The Black. The sessions came together rapidly. The album’s first single and title track, “The Black,” evinced that sentiment. With a sidewinder guitar riff, industrial-style slam, and hypnotically haunting refrain, the song sees the group evolve their patented sound with a more potent punch. “Let It Sleep” stands out as the quintet’s heaviest salvo ever. Exploding on impact, the track builds into a guttural chant that’s immediately irresistible and impenetrable. The Black reflects the apex of Asking Alexandria’s singular style. However, that dynamic approach has defined them since day one. It’s what made millions fall in love with them on 2009’s Stand Up and Scream and turned “The Final Episode (Let’s Change the Channel)” into an RIAA Gold-certified smash. The 2011 follow-up, Reckless & Relentless, would bow at #9 on the Billboard Top 200, while From Death to Destiny debuted at #5 in 2013. Along the way, they’ve covered magazines such as Alternative Press, Guitar World, Revolver, Metal Hammer, Kerrang!, and more as well as touring alongside Guns N’ Roses, Avenged Sevenfold, Korn, Slipknot, and many others.